everytime I login to post something, I'm like..."who cares!" I mean, I love reading everyones blogs and find them VERY interesting because I could look for hours. Maybe not hours, but I do my fair share of blog-stalking. It's a nice break from writing a paper or studying or being bored before going to work. *I'm done with school in 3 weeks. *I got a new tattoo! Pictures coming soon, it needs to heal first. *Chris got a hair cut. YES. I did it, and it looks nice. 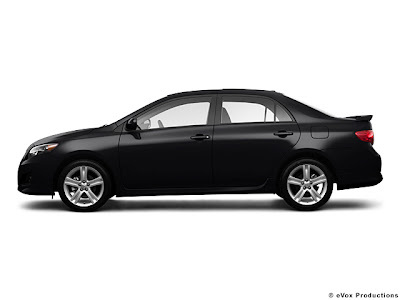 *I will be leasing a brand new 2009 Toyota Corolla in a few weeks. Leasing is a great option for me because your payment is much lower than buying, your car is under warranty for 3 years, at the end of your 3 years you have option to buy - or, you just lease another brand new car, and I get a discount because I will be graduating: my security fee will be waived, $400 rebate AND free roadside assistance for 1 year! cute, huh? Julia made me a kitty cake! This was after the tail was eaten. Mmm soo good! Chris took me to a super yummy/nice restaurant, Paley's Place. Look it up, SO GOOD. Here he is looking so sweet :) Thanks friends for all the wishes!